The last thing left to do, after I had done all of the fall decorating in my house, was the coffee table in my family room. This one spot is always the hardest for me to figure out what to do with! 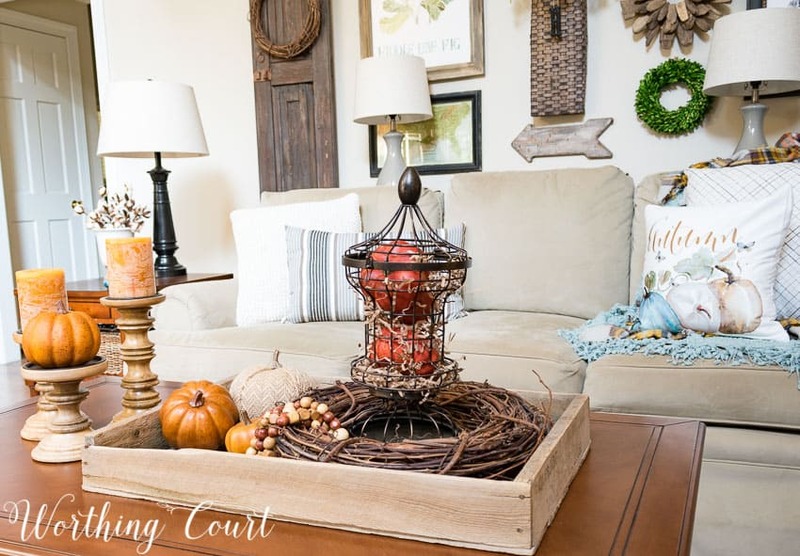 It’s a large coffee table, which is nice, but that presents its own set of challenges when it comes time to add seasonal displays. My number one goal was to keep whatever I did simple. To be honest, by this point, I was a bit tired of all the decorating around the rest of the house and just wanted something quick, that wouldn’t require a lot of thought. So I tried two different looks to see which one I liked the best. Scroll on down to the bottom to see which look I kept! But first, don’t forget to leave a comment on ANY blog post to automatically be entered to win my Reader Appreciation Giveaway! Here’s look #1. 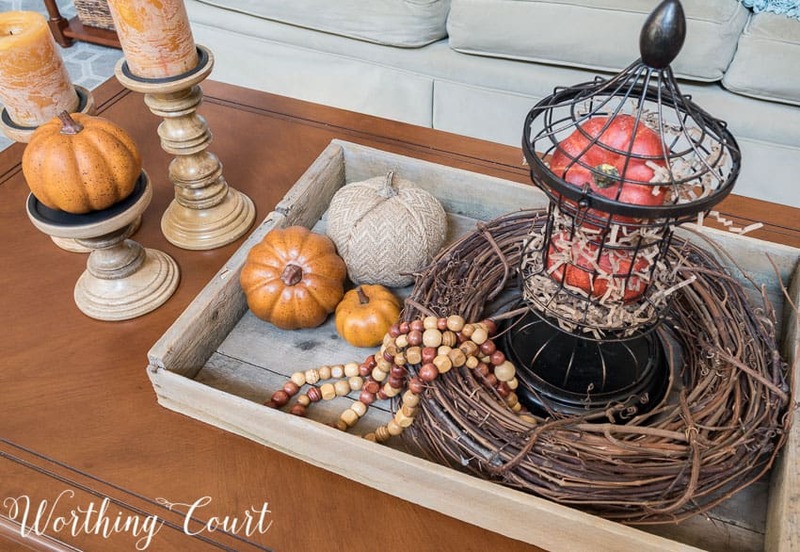 An old plant tray filled with fall goodies and three candlesticks off to the side. I mean, look how easy! I filled a wire cage thingy with rich rust colored pumpkins and brown paper filler. To give it height, I placed it on top of an old lamp base and then placed two twig wreaths stacked together around it. To fill the tray out, all I added were a few pumpkins and a strand of beads. I made the bead strands a few years ago to use as a garland on one of my fall mantels at my previous home. They’re easy to make – simply purchase a container of mixed beads at a craft store and string them onto fishing line. Click HERE to see the mantel that I originally used the beads on, but overlook that I spelled m-a-n-t-e-l incorrectly! The candlesticks help to finish the vignette off and to keep the tray from looking lost on the coffee table. For look #2, I used a rather large terrarium and filled it with pumpkins and cotton. Terrariums are so much fun to play with! You can fill them with anything for any season. Mine is on the big side, so it holds quite a bit. My beads made an appearance again along with a couple of books and pumpkins. Those beads are so versatile! I can’t believe that I almost gave them away when we moved. Alright. Want to see which look I kept on the coffee table? Do you think it’s look #1 or look #2? Drum roll….. I love the look of BOTH vignettes, but in the end, this one won the day because the terrarium was just a little two tall for me converse with whoMever happens to be sitting on the opposite side of the room. I’ll be sure to show where the terrarium wound up another day, but if you have sharp eyes, you just might spot it in one of these photos! 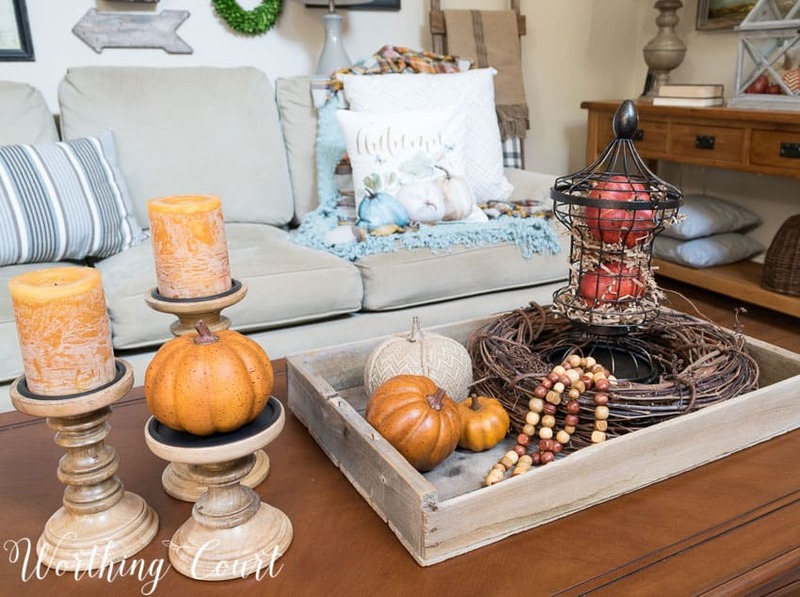 IF YOU’RE LOOKING FOR FALL COFFEE TABLE INSPIRATION, PIN IT FOR LATER! Very nice! I like both and glad I didn’t have to choose! Glad to see the terrarium used elsewhere. Using the cotton is the unusual pop in a fall display. I’m a real fan of your candlesticks and autumn pillow. Is it a Craftberry Bush pillow and where did you purchase the candlesticks? Your home is so cozy. Hi Doreen. So glad you like it! The pillow is from Amazon. I didn’t provide the link because I’m a little disappointed in the quality of it and didn’t want to recommend something that I’m not completely satisfied with. :/ You should be able to find it though, if you do a search on Amazon for “pumpkin pillow cover”. The candlesticks came from Target. Looks so cozy! I, too, love the beads! I may have to run to Michael’s and make some for myself! Both looks were great! I think I would have picked the same one you picked. Love the autumn pillow in the background. Love to see some blue in the fall decorations! I would have picked the tray too! Thanks for the inspiration. I will try something similar on my coffee table. Beautiful both ways:) Sharing on my FB page today! I like the first one too! I really like the candlesticks. The temps are in the 90s where I live. We are ready for fall! These are both superb, but I think I like #1best. Both great ideas! Thanks for sharing! Love the first one with the tray, nothing like fall decorations! Both are great. Love the first one better though! I too love Number 1. I especially like the richer rust colored pumpkins. They really add a pop! Thanks so much for the inspiration. I think I will get started today with my fall decorating. Like both also!! Thank you for showing us different ways to decorate!! I like both of them, but I agree the terrarium might have been too tall. Either way, even to a guy like me with no decorating skills, I think it looks great. I’ll try to notice it when I go home tonight. I like the first one also. 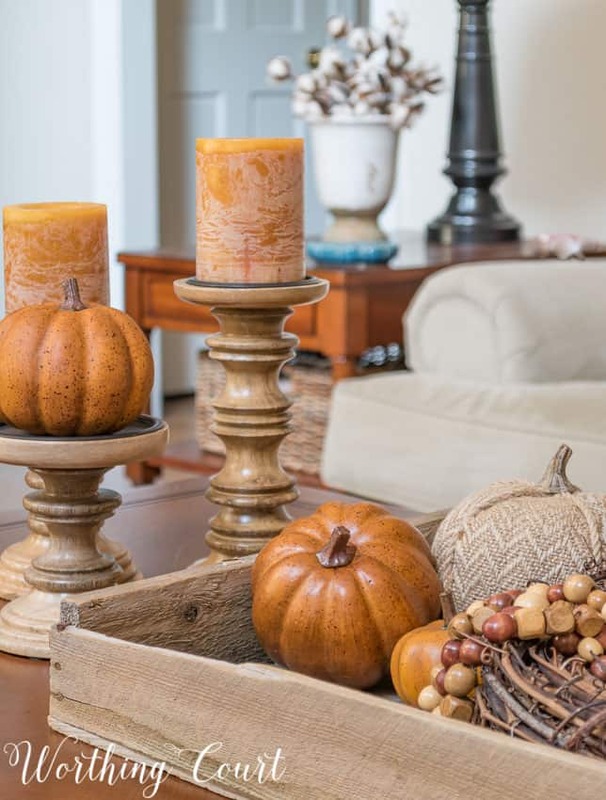 I love the candlesticks with the tray and then the pumpkins. Nice reply by your husband and so thoughtful. Your vignette looks beautiful!!! I hope that you have a wonderful day!!! 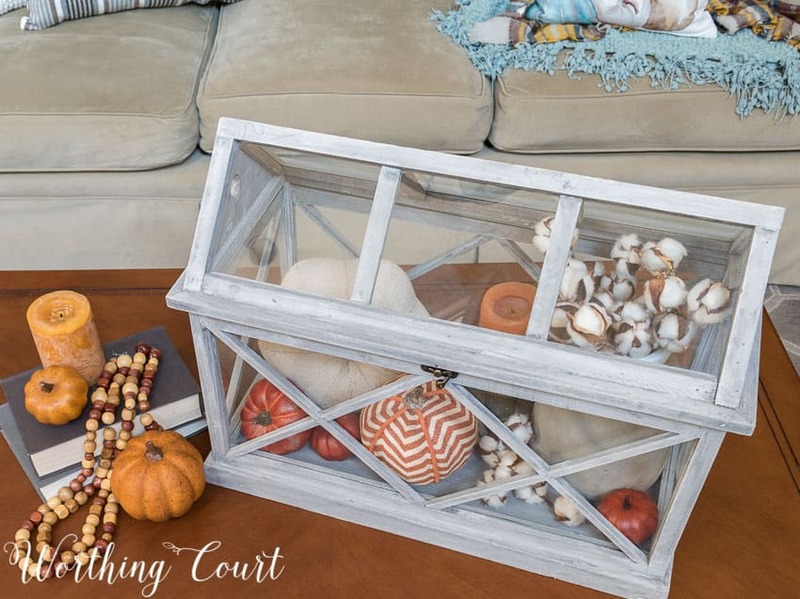 I absolutely love the terrarium idea – and I have one! I think it will be perfect in my living room, which is not our everyday space . . . so it won’t be in the way! Thank you for the inspiration! Suzy, I prefer your tray vignette but I plan to use your idea to combine cotton stems with pumpkins for my living room but in soft shades of pinks and creams. I wouldn’t have come up with the idea to mix these items but they totally rock. Thanks again for sharing your ideas. I prefer the first one as things are sitting lower. Thank you for the contest. Love the cotton balls. I think the pumpkins in the wire cage is unusual. They both look great, but I prefer the one you went with! Less heavy on the table I think! Love your blog and ideas! 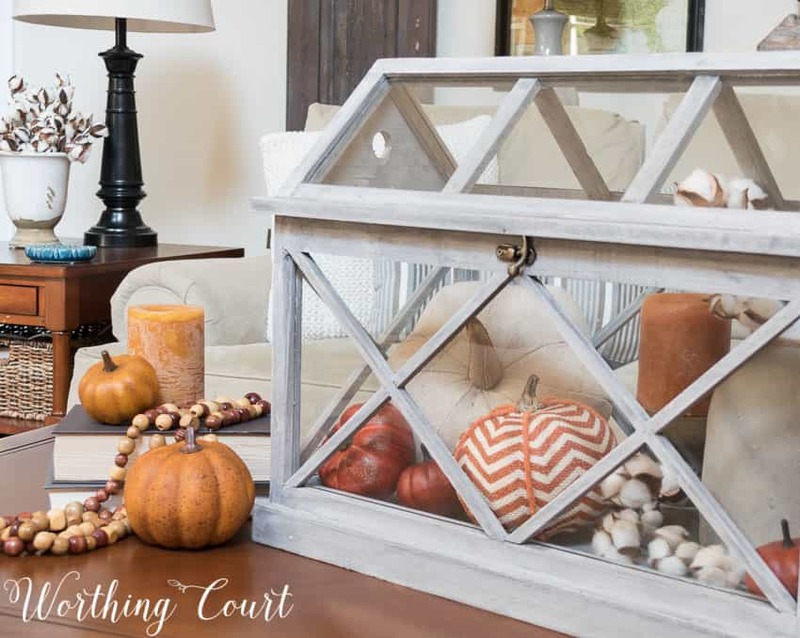 I like #2 best, but then I like all fall décor. Anything that makes your home feel cozy is a plus. I love the colors of fall , the oranges of the pumpkins and the burnished look of the candles. I really liked your pillows on the coach as well. Lovely as always! Saw a terrarium at Michaels and now wish I’d bought it. I have the same pumpkin pillow; got mine from Society 6 and am so pleased I just ordered more. The blue pumpkin really complements the greys in my living room. Than you so much for sharing and inspiring! My favorite is the tray with the pumpkins and candles. #1 was my favorite too. It looks great! So warm and inviting. Were did you find the cotton? 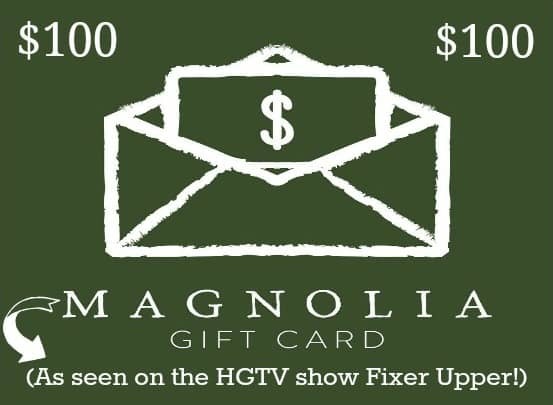 So like a vignette from Fixer Upper. Hi Jane. I ordered stems of it from a catalog about three years ago. You can find it today on Amazon by doing a search under “Artificial Cotton Stems”. Both ways look beautiful but I agree with your choice! Both are great, but would have also gone with your choice. Might need to make those beads. I like #1 the best but it was a hard choice. I have a terrarium in white that I love and just had to have. One and you are addicted so now I have two. I love them both … they’re beautiful, and I look forward to seeing more of your Fall goodies! I love both although my favorite is the tray ! I’m in love with the beads? Love them both. 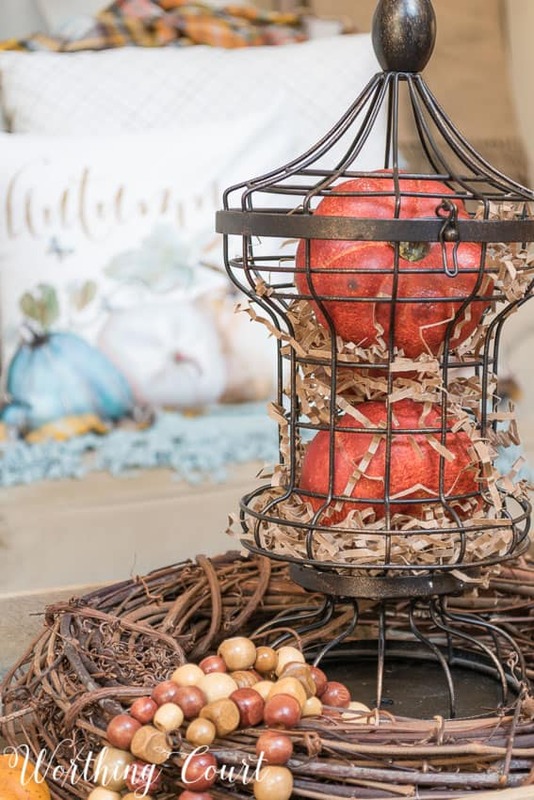 I love fall and am ready for cooler temps and fall decor. 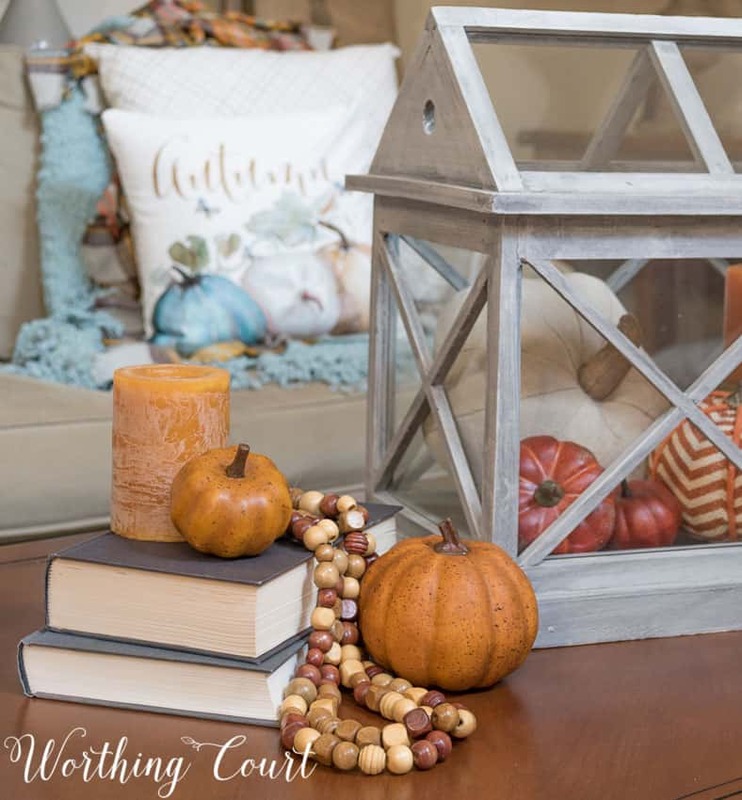 I love those orange candles ~ fall is my favorite season because the colors all make me feel good! I loved the plant box! Such inspiration. Thanks for sharing. I love #1! Trays are a must to have and I think the first one showed more fall color than the second one. And fall color is what it is about! I love your ideas! Love the chevron pumpkin! Did you make it yourself? If so, is there a diy for it someplace? I am so excited to see the twig wreaths used in a tray. I have two of them that I am going to try tomorrow. Thanks for the idea!!! So the tray is my favorite! Both styles are lovely for fall. You’ve included so many great elements. I love the use of the wreath on the table. Pinned to my autumn decor board. Thanks for sharing at Snickerdoodle. I like both looks, but I agree that the terrarium is a little large to be practical. I also love that pumpkin pillow in the background! I love those candles and adding the pumpkin on one of the candle sticks is really cute! You have nice decorating taste. Thanks for sharing on Family Joy Blog Link-up. Please come back and join us again! Remember to leave your host a comment to increase the chance of being featured. 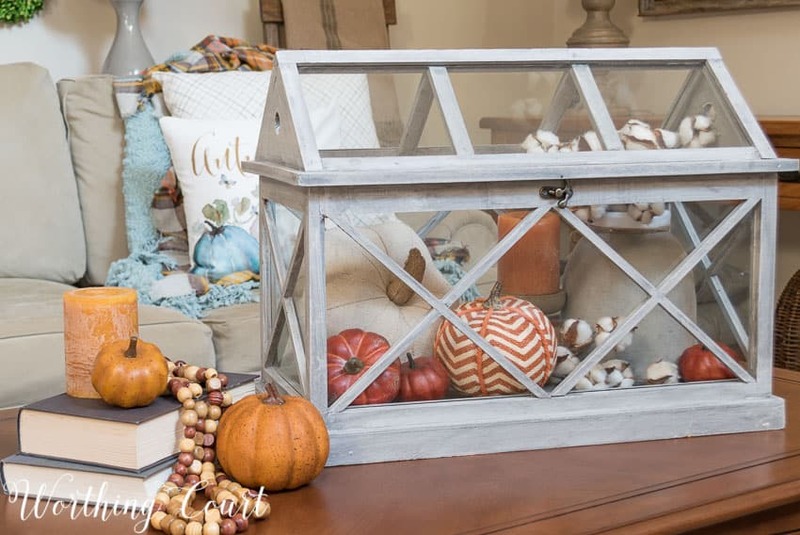 Thanks for sharing your fall decor displays at Craft Frenzy Friday on Mom Home Guide. They both look fantastic! This is beautiful! I like how seasonal it is, and how it can be changed according to current time. Warm cozy and so fall! Thanks for all the great ideas! I really love, love, all the interesting textures and in your home. From the walls, sofa, and tablescape. It all comes together splendidly. Love the Vignettes. You made a wise choice by finding a place for both of them. Makes me think about some warm apple cider and fall treats. I really enjoy your ideas. I am going to get some beads and will probably find other things to string into garland! 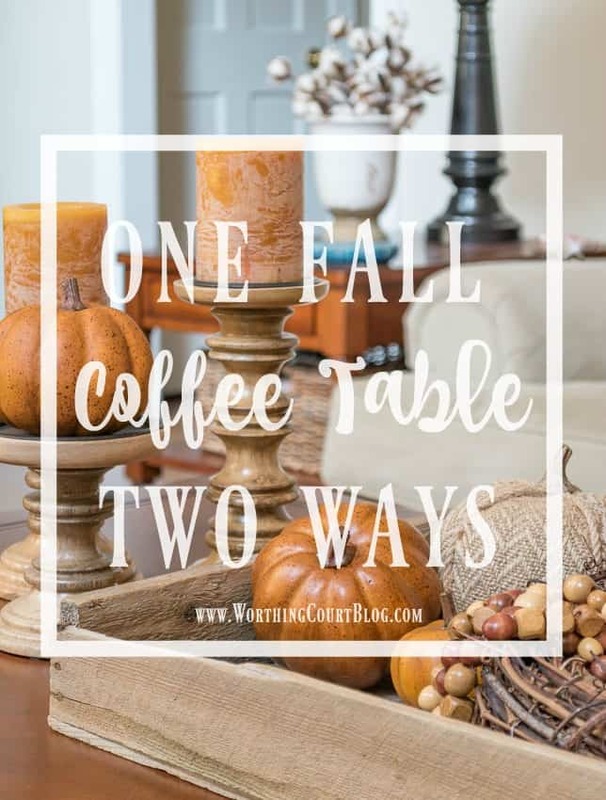 Love the coffee table two ways! I will be copying the first one as I have most of the things I will need!! 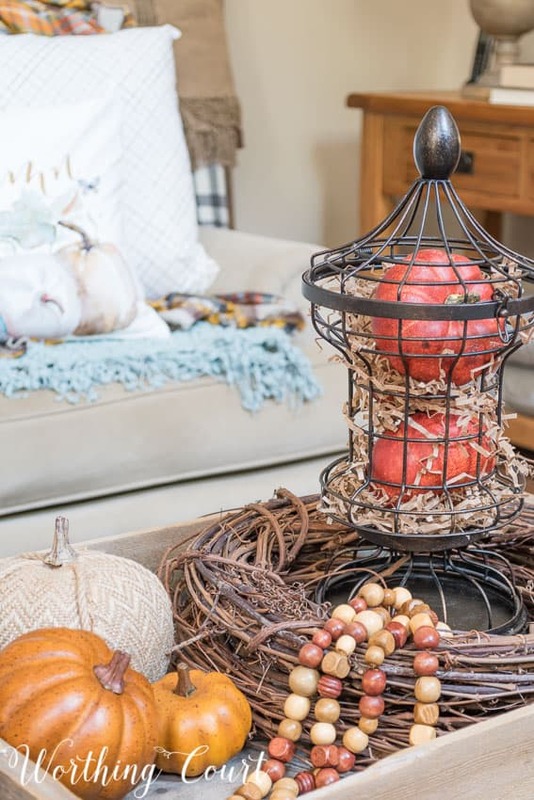 LOVE ALL YOUR FALL INSPIRATION, Especially the use of the twig wreaths. I am waiting for hobby lobby to have them on sale! Hope all is going will with the condo redo. Thank you for your beautiful and inspiring ideas!!! Both coffee tables are gorgeous. Thank you for all your inspiring and informative comments. Both coffee tables are gorgeous. Thanks for sharing all your helpful and informative tips!